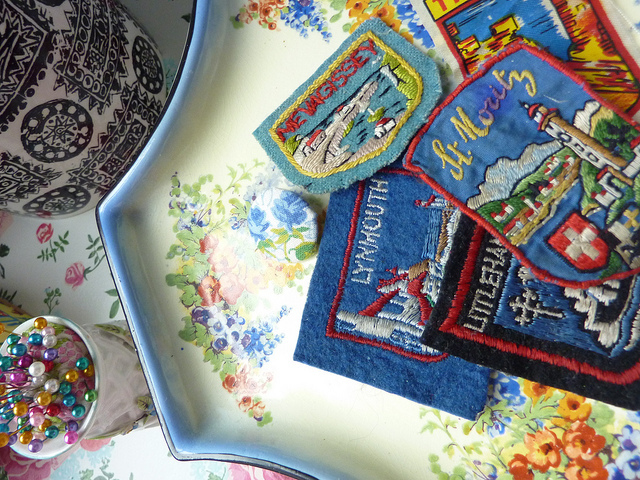 Not sure how this came about but next to my sewing machine I keep a cake stand of brooches - well it started off as being used for souvenir patches and then all sorts got added in to the mix. Bronte likes to rummage through and find something 'new' to sew on or wear. Yesterday I decided that it needed a clearing so now I just have some embroidered brooches. Oh and some wooden ones that I made from an old puzzle..more of that in a moment. The puzzle brooches story - a couple of years ago an elderly gentleman was selling some of his things at a car boot. 'Oh could you not give this to someone in your family' I said. He had no family...this wooden puzzle clock was 20p - heartbreaking really. Half the pieces were missing (judicious photography here) so eventually I decided to make the removable pieces into brooches - one for a different time of the day and different seasons (I am quite busy 'brooch changing') !!! Today I will be wearing the 'beach' brooch! Just dug out the older photos of previous incarnations that this cake stand has been used for! The house is in a constant state of flux! Your house sounds a bit like mine! I love those embroidered brooches -I have a two! Sounds lovely Julie - I would love to see those brooches. Aha now I know what you meant! I've not seen little mini garden brooches and yes you were quite right, I do need one to carry my garden around with me! I do like a brooch or two myself another thing to keep my eyes out for, a garden and I'd rather like an allotment one! Love those embroidered brooches. The clock puzzle pieces are just lovely! 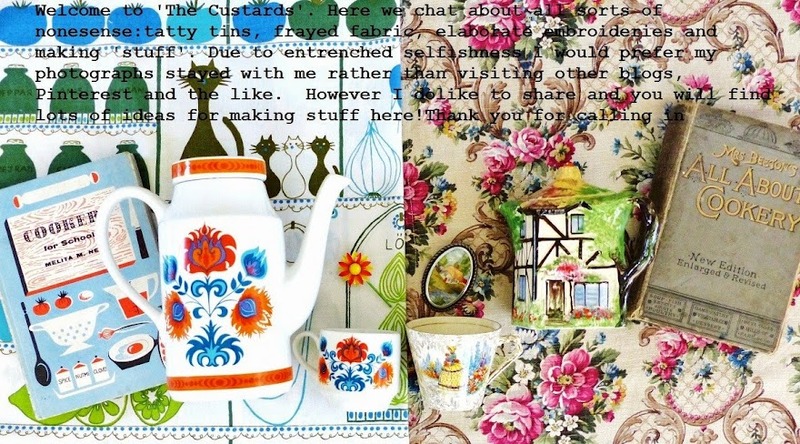 Many thanks Liz - a use for tablecloth scraps too perhaps? 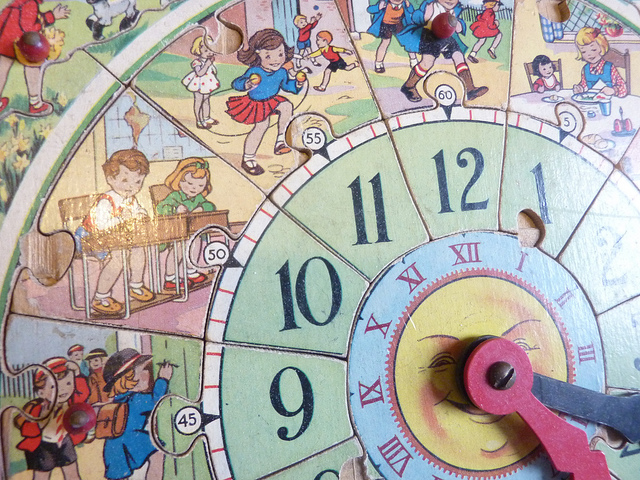 I have that clock puzzle complete - was rescued from my parents attic the other year when they had a good clear out. Love the idea of using incomplete puzzle pieces as brooches though but my puzzle is staying safely away from the glue gun! I can remember Churches shoes - they were considered the next best thing to having bespoke shoes made as they didn't just have width fittings but also ankle fittings - I have feet like a duck - they are about as broad as any foot can get but when I was younger I had a very narrow ankle..I almost bought a pair of Churches in the 1980's and I can remember how they felt like a second skin.....sadly these days no one goes to that much detail. 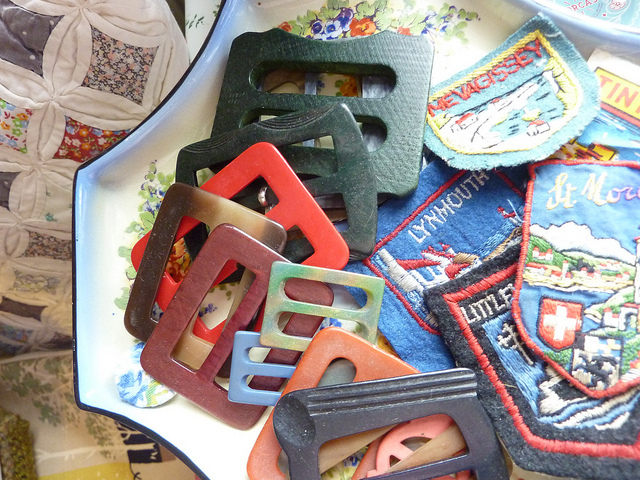 I have a bakelite box full of buckles - some vintage bakelite, others metal , others plastic. Any inspiration about projects for using some of them up? Dear Angela - I have made a little post with ideas and will post that soon. Hang on to them! I will be canvassing some publishers today and keep you posted ho ho! That is really sweet Floss - I wish that I had a Camp Blanket, sounds delicious. The brooch sounds a real wonderment - I shall keep an eye out for one with a black background as I do think that black is a good setting for colour. I have to say I have never seen embroidered brooches such as yours but perhaps I have been looking in the wrong places. They are certainly lovely. I am always buying brooches so I shall have to look out for these. The jigsaw piece brooches are a great idea. Oh Philippa this made me roar with laughter - thank you for your bra tale. I think that this is what second hand, 'vintage' is all about don't you - just memories and 'ooo I remember that' type stuff. Happy bra memories! I sign for a B&B journey to Jenny's treasure chests! Goodness me that is a collection and a half Anne-Sophie!! I too love those Kensitas silk flowers - only last week a woman in front of me bagged a nice little collection of them for 3.99. I did not mind.....much!! !